A new Arkham is on the way, and a new studio is making it. After years of waiting, gamers will finally have the opportunity to discover what dark forces drive Bruce Wayne's obsessive war on crime in Batman: Arkham Origins, a new addition to the hit Arkham series set years before the events of Arkham Asylum and Arkham City. The game will follow the adventures of a "young, unrefined" Batman as he encounters many of his supervillain enemies for the very first time! Of interesting note is the fact that Arkham Origins is being developed by Warner Bros. Games Montreal rather than Rocksteady Studios, the developer of the first two games in the franchise. But not to worry - WB Montreal has "full access to Rocksteady's custom modified Unreal engine to capture the look and feel of the Arkhamverse," according to Game Informer, and is being creatively directed by Eric Holmes, whose CV includes The Incredible Hulk: Ultimate Destruction and, perhaps more encouragingly, Prototype. 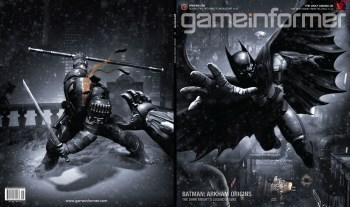 The Game Informer cover reveals that Deathstroke is one of the unsavory sorts that Batman will face in the game, and is otherwise about what you'd expect: a burly man with deep-rooted psychological problems and a flying rodent costume, who looks like he's just itching to lay a beatdown on someone. As for the plot, I would think that the "Origins" bit would tell you all you really need to know, but the good news is that you won't have to wait long for the details if that's your thing: Batman: Arkham Origins is set for release on October 25 for the Xbox 360, PlayStation 3, Wii U and PC.